Precious metals futures logged gains Thursday ranging from 0.4% for gold to 2.5% for palladium. Palladium’s daily advance was its third in a row, and it finished at a new record. Gold for December delivery gained $4.90 to settle at $1,215 an ounce on the Comex division of the New York Mercantile Exchange. The settlement was the highest since last Thursday, Nov. 8. "Some worries about the health of the U.S. stock market, following the recent sell-offs and increased volatility, are supporting the safe-haven metals," Jim Wyckoff, a senior analyst at Kitco Metals Inc., said in a report. "The precious metals bulls are impressed their markets are able to post modest gains today in the face of a stronger U.S. dollar index." Gold futures ranged from a low of $1,207.10 to a high of $1,217. They rose 0.7% on Wednesday, fell 0.2% on Tuesday — marking their lowest price since Oct. 10, and they shed 0.4% on Monday. Silver for December delivery tacked on 18.3 cents, or 1.3%, to settle at $14.263 an ounce. Like for gold, silver’s close was also the highest since Nov. 8. Silver futures traded between $14.07 and $14.31. They added 0.7% on Wednesday, declined 0.2% on Tuesday — ending at their worst price since Jan. 15, 2016, and they lost 0.9% on Monday. January platinum advanced $11.50, or 1.4%, to $845.30 an ounce, ranging from $832.70 to $848.60. 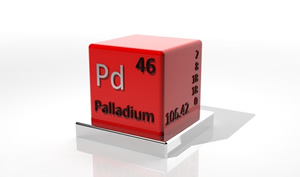 Palladium for December delivery rallied $27.20 to $1,137.40 an ounce for a new all-time record. Palladium prices trading between $1,105 and $1,161.50. "There seems to be good demand (for palladium) from electric cars and diesel engines in Europe and China," Reuters quoted George Gero, managing director at RBC Wealth Management. "Palladium is in shorter supply than people realized." Gold gained $8.60, or 0.7%, to 1,211.85 an ounce. Silver rose 16 cents, or 1.2%, to $14.13 an ounce. United States Mint bullion sales increased by a combined 3,000 ounces in American Eagle and Buffalo gold coins and by 450,000 ounces in American Silver Eagles.